Siopao (simplified Chinese: 烧包; traditional Chinese: 燒包; Pe̍h-ōe-jī: sio-pau), literally meaning "hot bun", is the Philippine version of the Cantonese steamed bun called cha siu bao. It is a popular snack sold mostly in Chinese restaurants or by sidewalk vendors in the Philippines. There are different varieties based on the filling: asado or bola-bola (a combination of pork, chicken, beef, shrimp or salted duck egg). There is also a baked variety. There is an urban legend about the snack alleging that cat meat is used in the production of siopao. According to historians, this story could have came from a certain sentiment towards the Chinese Filipino community or it was theorized that it could have been a smear campaign by competitors or illegitimate children from a Chinese family which runs a siopao business. There is a similar derivative in Thai cuisine called salapao (Thai: ซาลาเปา). Salapao are sometimes made with a sweet filling for a dessert. It is also a favorite in Hawaii where it is called manapua. Bāozi, the Chinese version of the steamed bun. ^ Frances Lorraine Haw-Ang (August 25, 2010). 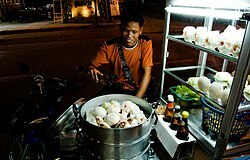 "Top 10 Siopao in Manila". www.spot.ph. Retrieved 21 December 2010. ^ "Ang Pinaka: Ten popular Pinoy urban legends". GMA News. 17 October 2014. Retrieved 7 August 2018. ^ "Salapao – Chinese Steamed Buns". www.thaizer.com/. January 15, 2010. Retrieved 21 December 2010. This page was last edited on 20 January 2019, at 01:16 (UTC).